For those who have read the comics, the eighth season of The Walking Dead finally sees the show stand on its own two feet, taking a huge departure from the world that Robert Kirkman created. In the past characters in the comics haven't appeared in the show, whilst other individuals, like Daryl, were created especially for the TV series. In some instances characters from the comics died early on, yet the TV show kept them going, while it's the other way around for some. There's a character called Holly who plays a prominent role in the comics, but she's only in the show briefly in season five and six. Conversely, in season one of the show, Shane plays a prominent role, whereas he leaves the comics pretty early on. I've been following the comics (and I'm up to date on those) and so this season, as always, had quite a few surprises in store for me. Some good, some not so good. I actually enjoy the fact that the two sit side by side in slightly different universes, because you never know what is actually going to happen. In the comics Negan explains the origins of Lucille, his trustee baseball bat. While it's handled well, it has much more impact in the comics. The two major shifts are the mid-point of the season (which acts as the show's mid-season break when originally broadcast) which ends on a surprising cliffhanger; and the very last episode where the dynamics of the relationships changes drastically. Without spoiling it, this does kind of happen in the comics, but in the TV series it's focused to the point where it looks like Rick's actions may have turned some against him. There's an episode where Jeffrey Dean Morgan's Negan actually comes across as the good guy, while Rick comes over as the "prick" Negan keeps calling him. What I loved about this season is how different Morgan's Negan is. In the comics he's an unhinged, comical, mad man. Morgan gives him a real personality. You can relate to him and believe that he really does see himself as the good guy. I love both interpretations of the character, for very different reasons. In the comics, he's light relief; always ready with an inappropriate comment (in fact there's even a book you can buy that quotes most of his best lines - The Quotable Negan), but there's always the threat that he'll lose his sh*t and start killing people. In the TV show his comments are low key, but his ability to lash out is ever present. It's his humanity that is more evident here and what makes the character actually almost likeable. So, you can see why the Saviours would follow him as he strives to make the world a better place, in his eyes. The rest of the main cast play their parts throughout this season, although Norman Reedus's Daryl is oddly low key, but then he did play a significant role in season seven. The problem with an ensemble show like The Walking Dead is that it's hard to service all the characters. In fact the show's finale actually reaches its climax just over halfway through the episode. The remaining time follows up on each of the main characters to show where they're at. 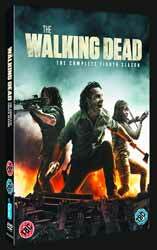 Extras include three audio commentaries: Episode 3, with executive producer Scott Gimple and writer Matt Negrete; Episode 4 with Gimple and director Dan Liu; and Episode 16 with Gimple and writer Angela Kang. There's nothing particularly noteworthy here other than the final episode commentary where they point out scenes that are in the DVD release that were cut for time from the broadcast version. Disc 6 contains the features: Inside the Walking Dead (54 min, 49 sec short features on some of the plotlines and character developments - one per episode); The Making of the Walking Dead (45 min, 35 sec - going behind the scenes of every episode. Interesting elements include the blowing up of the RV that has been with the show since season 1, the revelation that the lighter Rick uses to set fire to Lucille was the one originally owned by Glen; ***** Leaving a Legacy (8 min, 26 sec look back at a character who leaves the show - I've kindly hidden their name; and In Memoriam the Price of War (9 min, 33 sec run down off all the characters that died this season). Bear McCreary's music seems to be more noticeable in this season. There are a number of occasions where his compositions really shine through. Even the audio commentaries pick up on this. The only grumble I had, and this is the same complaint I make every season, was that this is a 5-disc collection at most, and certainly not a 6-disc release. The episodes are spread thin on the discs as it is, with the final disc housing the features. You can easily get four episodes and some extras on a single disc. Another great season which you'll be pleased to add to your collection.